connartist88h wrote: Has there been any consideration of single-track overnight operations? I know the Munich U-Bahn has sent inbound and outbound trains to the same platform during scheduled overnight construction. This would be a viable option if service is provided with headways of twenty minutes or more, and sufficient switch-tracks exist. When WMATA single-tracks through stations, it puts up physical barriers. At dual platform stations, that means cutting off access to the out-of-service platform, at island stations it usually involves putting up some of that plastic temporary yellow "fencing" on the side that's not being used. 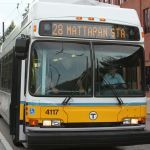 "Starting next year, the T will run all subway trains and the 15 most popular bus routes until 3 a.m. on Saturday and Sunday. Yes, the T is still cash-strapped, and the state budget remains tight, but Governor Deval Patrick has found about $20 million, along with pledges from corporate sponsors, to launch a one-year pilot program to begin in March or April." I would think the T could get sponsors to foot most of the bill for this, if its marketing department were really creative. Right now, Patrick/Davey said the state is hoping sponsors pony up $2m to $5m. Also note that the Globe has a sponsorship deal tentatively in place, and that's probably why it got the scoop. EDIT: Globe story is back up, about 45 minutes after it disappeared. Even so, going to wait to hear official word from the MBTA before I get my hopes up. Here's hoping they eventually add later commuter rail trips as well. Those of us from the suburbs who don't drive into the city already have to spend the night if we want to stay past 10 or 11 pm, which is now going to be 4-5 hours before the T stops running. I haven't seen anyone yet mention the previous work by the MBTA Rider Oversight Committee which laid the foundation for this current 1-year trial. Hopefully the revamped University Pass program will indeed be a long-term solution to funding the Late Night weekend service. I think the $20 million plus corporate sponsorship is likely a one-time funding measure to get the late-night service off the ground while the BU MBA students are doing their work. bostonmagazine.com wrote: The MBTA Rider Oversight Committee, which operates on its own and discusses customer service improvements and service quality issues at their monthly meetings, will submit an official recommendation to MBTA board members on July 29, regarding a means to fund overnight service through the use of a re-envisioned college student pass program similar to those used by universities all around the country. Earlier this year, the committee tasked themselves with finding a way to make overnight service a reality by sending out a survey asking riders how they felt about adding the amenity. After receiving thousands of favorable responses, the committee put together their proposal, which offers ways to implement the service without adding to the MBTA’s existing debt load, according to their report. Without the funding from a new University Pass program I don't think the late-night service (even just Friday and Saturday nights) will be sustainable. Perhaps they will raise fares on the Late Night Chuck routes to $5 or $7 to help cover costs? Still much cheaper than a taxi, or driving into the city and risking returning drunk. Rbts Stn wrote: Perhaps they will raise fares on the Late Night Chuck routes to $5 or $7 to help cover costs? Still much cheaper than a taxi, or driving into the city and risking returning drunk. The last I heard, the existing AFC software from Scheidt & Bachmann won't allow for any type of time-of-day adjustments at all. Worse, there's apparently been a falling-out between Scheidt & Bachmann and the MBTA and I don't think we'd even see any new software / programming of AFC to allow for late-night route fares to be added. (In other words, it's definitely not possible for subway AFC gates to switch after 1AM for example but it **might** be possible for a bus or Green Line AFC machine to have a different route punched in by the operator. Same idea as the Local / Inner / Outer bus fare zones which are manually activated.) However adding those new fare levels would require work from Scheidt & Bachmann and right now it seems like that's very unlikely. Even the more customizable "mTicketing" smartphone app - even if it could be adapted for late-night bus & Green Line operations - doesn't really help because you can't discriminate against someone who doesn't have a smartphone. I think as far as funding / fares is concerned, the only real solution is the University Pass program overhaul that the ROC proposed. Anything else would require AFC changes that are unlikely unless MassDOT takes over Scheidt & Bachmann. The last I heard, the existing AFC software from Scheidt & Bachmann won't allow for any type of time-of-day adjustments at all. Worse, there's apparently been a falling-out between Scheidt & Bachmann and the MBTA and I don't think we'd even see any new software / programming of AFC to allow for late-night route fares to be added. But the system now knows when student passes are valid, so there has to be some kind of time control. TrainManTy wrote: What's the signaling/ATC system like if trains were to run wrong-main? To my knowledge this is no problem, at least on the rapid transit lines. The ATO system handles it. Forget it on the Greenline! The MBTA should own the actual source code. These Scheidt and Bachmann people were just the contractors who wrote it. Worst case, they can get the MIT kids to patch it..
That is incorrect. The system is not bi-directional. Whenever a train has to run wrong iron, it is on the bypass. This is why it is very seldom done, because they're basically operating in dark territory without a proper code. Regarding the fare system, if they couldn't update the system then how would they update the fare structure after an increase? The T isn't going to set it self up with a software system that it cannot update, especially when it's the one that handles their revenue. Despite the fact that is an overall horrendous system, it is certainly capable of being updated. Systems which run 24/7 cannot do so without ever having a disruption. Things have to be maintained. I'm not sure how other systems handle that but I'm sure they have to shut down some time. The MBTA doesn't want to have regular service shutdowns or alterations to the public schedule (and rightfully so! ), so they schedule the shut down nightly. In response to the comment about NYC's two track lines, they have enough redundant routes and alternate paths that they divert service all the time like it's nothing because they can with minimal impact. Boston does not have that luxury. As has been said before, however, operating later on non school/work nights shouldn't pose much of an issue for them. 24/7 service is a completely different story. The only thing that can be updates IS the fares. They cannot change anything else in the system. They cannot add Zone 9 and 10 into the system for the CR. They cannot modify the machines to require a Student or a TAP card to purchase a discounted half fare ticket for the CR. They have to pay big bucks to make software updates, and the T seems to work around paying for these updates. Finch wrote: To my knowledge this is no problem, at least on the rapid transit lines. The ATO system handles it. Ah, thanks. I was thinking of test trains that occasionally run overnight on wrong iron, but I forgot they need bypass for that.